Beards are one of the must have accessories for men in 2014. If you already have one, maybe you’re ready to move from short beard to epic beard status. Here’s how to grow a long beard and trim it too. Growing a long beard is pretty simple. One. Grow facial hair. Two. Take care of it. How long will growing a beard take? It depends. Everyone has a genetically determined maximum growth rate but there are ways to ensure you reach your potential. How to make a beard grow faster? Basically, healthy living with good diet, exercise, and adequate rest. Keep reading for the details. 1. Diet – Elements of the controversial paleo diet are one of the ways to stimulate hair growth. Increase consumption of high quality sources of protein and fat, like free range eggs and organic or grass fed meats to promote facial hair growth. Sugar, on the other hand, grows very weak hair. 2. Testosterone – Testosterone is related to hair growth. According to “Facial Hair Handbook” author and two-time world beard champion Jack Passion, exercise increases testosterone levels. Combine weight lifting that targets major muscle groups like squats, deadlifts, and cleans with cardio (or hit up your local Crossfit gym). 3. Sleep – As an adult, your body repairs injuries and grows hair during sleep. Aim for 6-8 hours of uninterrupted sleep in a dark room. The more the better. Now that your beard growth is maximized, its time to care for facial hair. There are natural oils that protect hair but for harsh conditions like a chlorinated pool or windy day outdoors, protect hair with a light covering of jojoba oil. 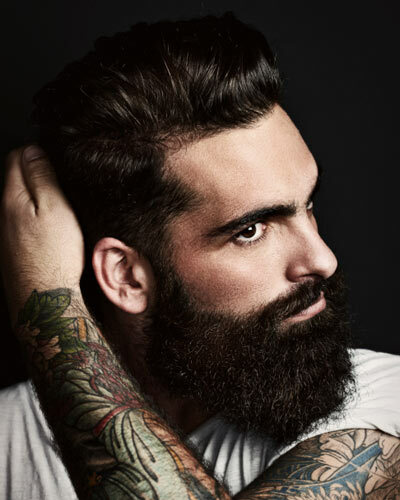 Beard maintenance will also keep beard hair from itching as well as soft and conditioned. If you’re committed to a long beard, it’s best to skip trimming until you reach the desired length. If the result is too shaggy for your job, start earlier. When first trimming your beard, start slowly and carefully. It is much better to spend more time maintaining the beard than regrowing it. At this length, many men find that facial hair can differ in color from hair on the head. Beards often have red, grey, or other colors in them. Check out this beard coloring guide if you want a new look. Here’s how to trim a long beard. Even with long beards, use a regular beard trimmer for the sides. Choose a long guard length and start with the sides of the face, above the jaw line. Starting with the highest guard and working your way down will result in a closer trim and has less room for error. The rest of beard trimming is all about tapering hairs into a pleasing form. Start by combing facial outwards in every direction. Now you can use scissors or clippers, though a slip of the hand with the latter can do serious damage. Using fingers as a guide, roughly taper the beard into the desired shape. When you’re done, smooth hair back down against the skin and check out the results. If hair is not not short enough or the right shape, comb it out again and trim some more. Avoid over trimming by doing this in a few phases until you get practiced. The last step is to trim the mustache. Get out the beard clippers again and start with a longer guard. When the ‘stache is the right length, use scissors to clean up any rogue hairs and you’ve got a groomed, long beard.